It's no secret around here that I prepare and eat my spiced chicken recipe A LOT. It's quick, healthy, and yummy. 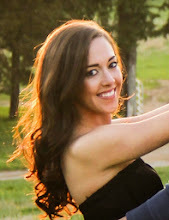 Because I have it multiple times per week, I "style" it in many different ways so it doesn't get boring. 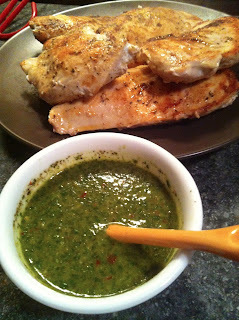 Dressing it with this cilantro-lime chimichurri sauce was a fabulous on-a-whim idea... so, so good! And adding bacon to a meal is NEVER a bad idea. 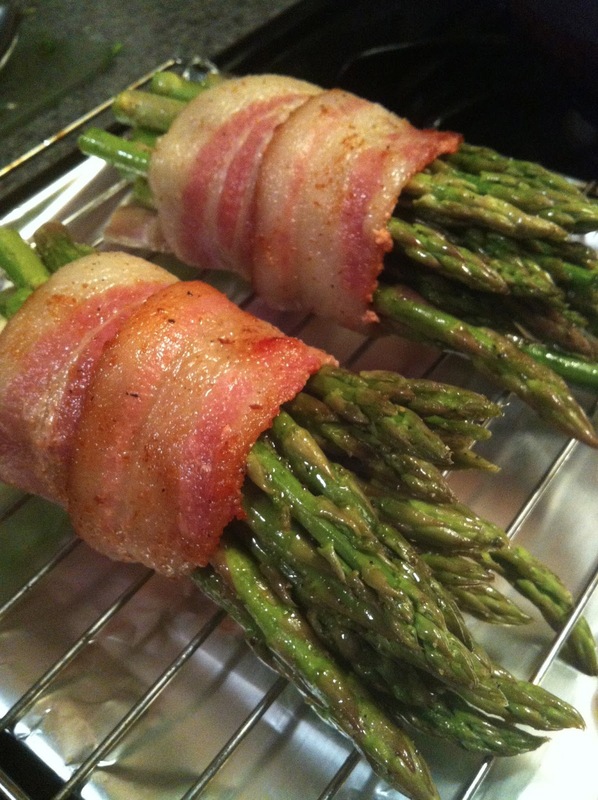 This bacon-wrapped asparagus is awesome. The whole meal is great - in fact, my boyfriend proposed to me while I was cooking it. It might even have special powers. Do you like cilantro? Some people hate it. I've even heard people can be genetically predispositioned to hate cilantro. These people are missing out! And do you like lime? You're kind of weird if you don't, honestly. But... you must like both of these ingredients to like this sauce... it's VERY flavorful, very cilantro-y and very lime-y. So it's very yum if you love these things like me! 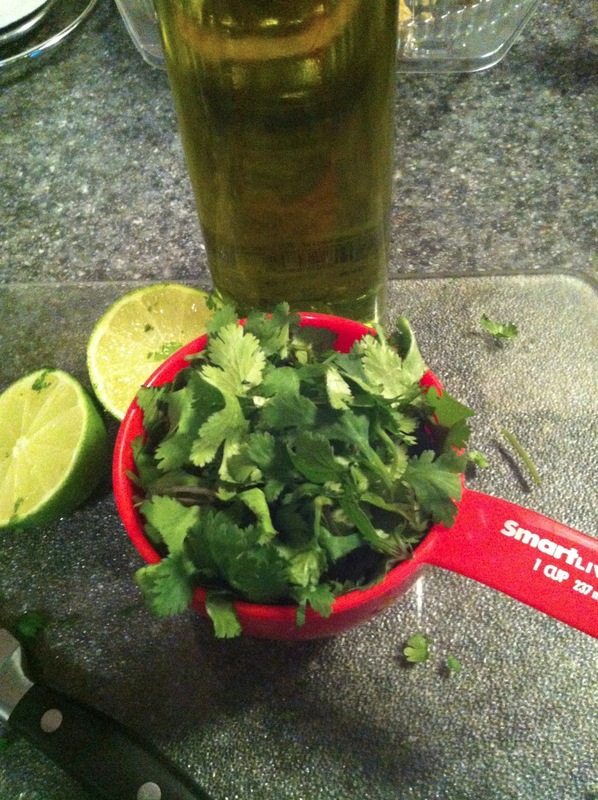 Gather just a few ingredients: fresh cilantro, a lime, olive oil, crushed red pepper, and 2 cloves of minced garlic. And salt and pepper. 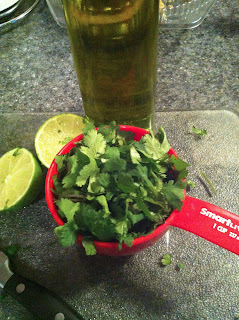 If you're not crazy about cilantro like me (seriously... you must love it to love this), then you could replace half of it with parsley and mild out that flavor a bit. 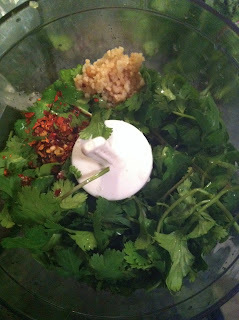 Add the cilantro, lime juice, garlic, and red pepper to a food processor. Pulse until chopped well. Then, slowly add in 1/4 cup of olive oil through the top of the food processor, one tablespoon at a time. Pulse until smooth. That's it! Yum. Perfect accompaniment for the spiced chicken. This meal goes wonderfully with bacon-wrapped asparagus, which is a great way to make your greens a little tastier while still keeping it low-carb and healthy (it's just one piece of bacon per serving, y'all). And so easy. Wash, dry, and cut the ends off of your asparagus. 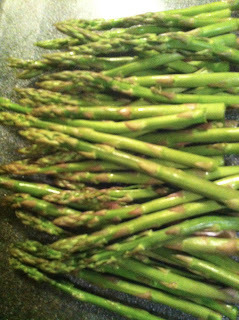 In a bowl, toss the asparagus in 1 tablespoon of olive oil, 1/4 teaspoon of garlic powder, and salt and pepper to taste. 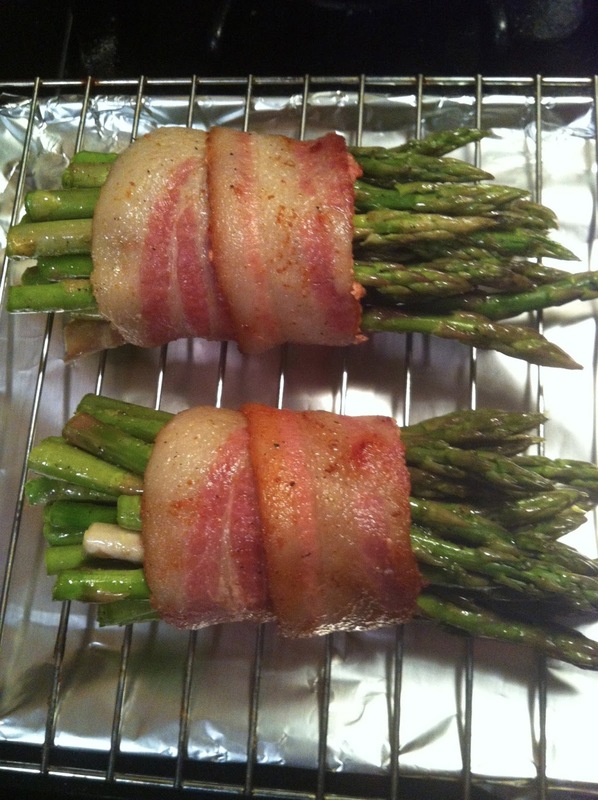 Then, you want to cook your bacon a bit before wrapping it around the asparagus and baking it, otherwise it will be too soft. So cook a couple of thick-cut strips of bacon over med-high heat for about 2-3 minutes/side, until slightly browned but not curled/crisp yet. Let drain on a paper towel. Before discarding of the bacon grease, though... toss a tablespoon or so in with the asparagus. Okay, you don't HAVE to, but how can you resist? Bacon grease makes everything awesome. Then, separate your asparagus into two bunches, wrapping each one in one strip of bacon. Place on a baking rack on top of a foil-lined baking sheet so that any extra grease can drip down. Serve alongside your spiced chicken topped with cilantro-lime chimichurri. Such a delicious low-carb, high protein dinner. *you can replace half of the cilantro with parsley for a milder taste. -In a food processor, combine cilantro, garlic, lime juice, and crushed red pepper. Pulse until the herbs are chopped. Add olive oil in slowly through the top of the food processor. Pulse until smooth. Pour into a bowl and add salt and pepper to taste. -Cook bacon in a skillet over medium-high heat for 2-3 minutes/side, until slightly cooked but not yet crispy. Let drain on a paper towel, reserving a tablespoon of bacon grease. -Toss asparagus in a bowl with olive oil, garlic powder, bacon grease, and salt and pepper to taste. 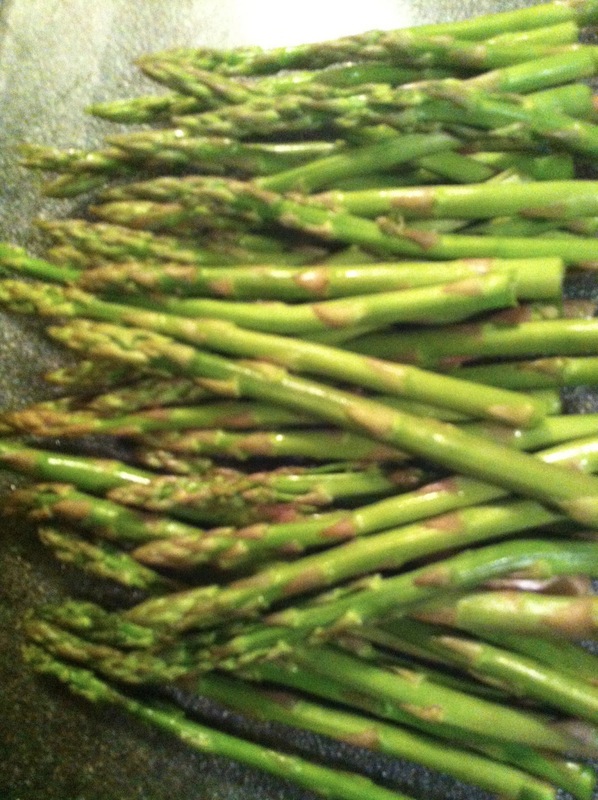 -Separate asparagus into 2 even bundles. Wrap one slice of bacon around each. Place on a wire rack on top of a foil-lined baking sheet. Bake for 20 minutes. I can't wait to try this - pinned it already! I don't know about bacon wrapped asparagus... 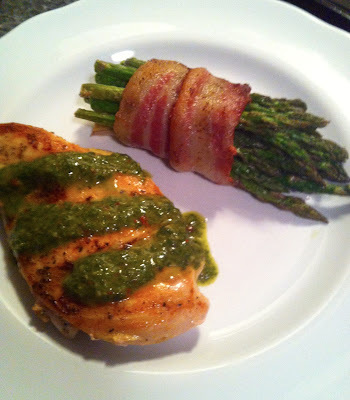 I love bacon, but not asparagus, but you sold me on the chimichurri!